1870s/1880s autograph album of Miss Artemisia Sallie Chiles, "Artie", of Independence, Missouri. She, or someone else, wrote her name on the second end paper. 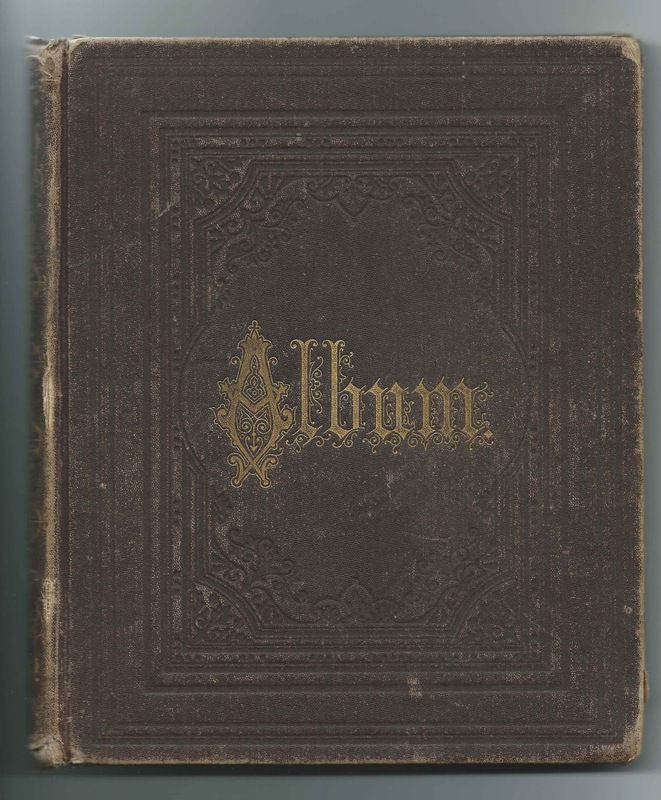 The album measures approximately 8-1/4" by 7" and contains the sentiments of nearly 60 of Artie's relatives and friends from Missouri, Wisconsin and Ohio. 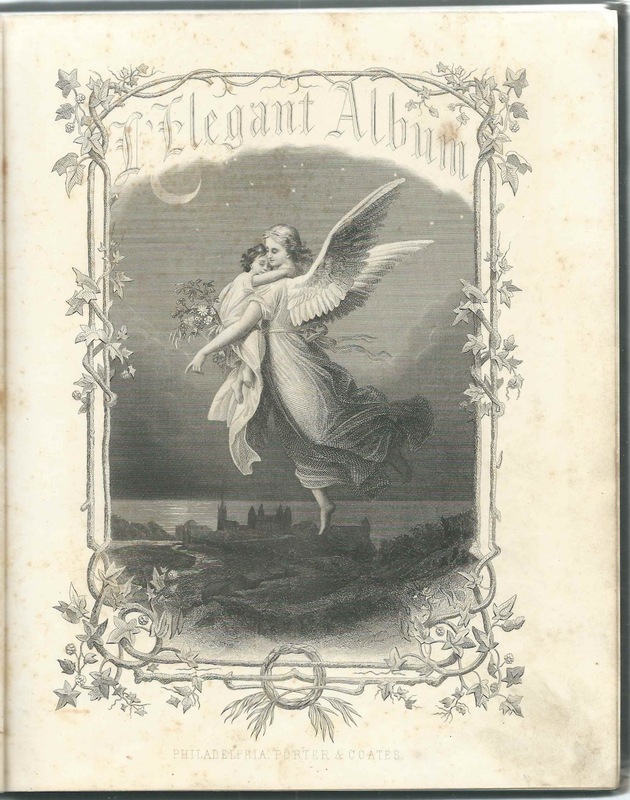 The album, published in Philadelphia by Porter & Coates, also contains 5 full page engravings, in addition to that on the title page below. Artemisia Sallie Chiles was born January 20, 1857 in Missouri, the daughter of Samuel Irwin Chiles and Mary Elizabeth (Hamilton) Chiles. 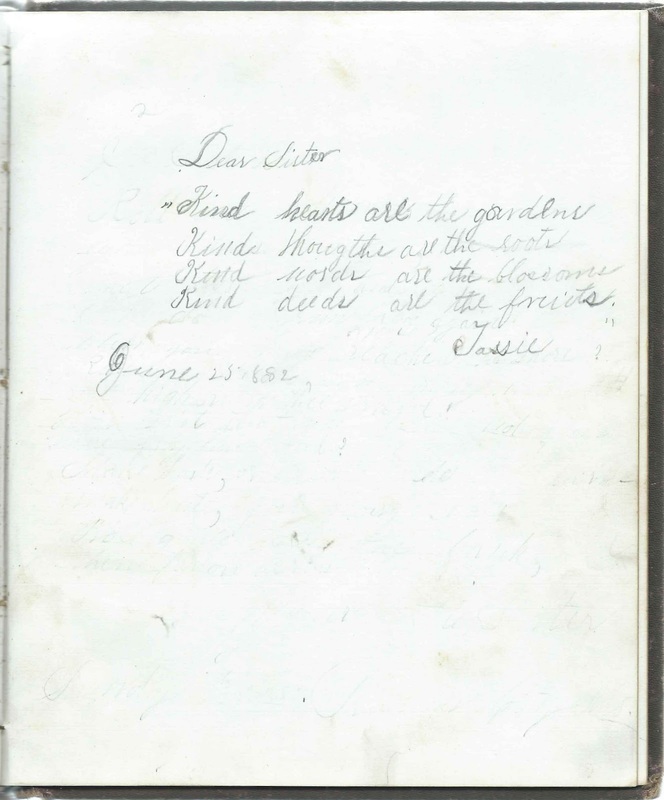 Samuel was presumably the "Pa", who inscribed a page on March 15, 1876. 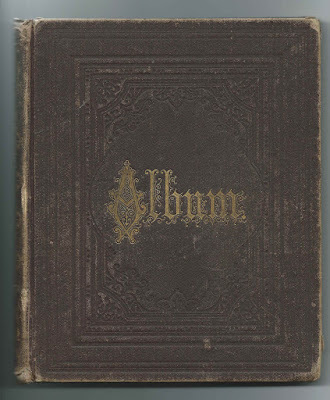 Artie had a younger sister, Itaska B. W. Chiles, "Tassie", who inscribed two pages in the album, one in 1882 and the other in 1886. Click on an image to enlarge it. About 1881, Artie married John Benjamin Atkinson, son of Dr. Malnor Treat Atkinson and his second wife Louise (Dyer) Atkinson. Artie and John had at least two children, daughter Louise Elizabeth Atkinson, born about July 1882; and Itaska B. Atkinson, born about March 1885. John Benjamin Atkinson died in 1931, and Artie died in 1941. They're buried with family members at Mount Washington Cemetery at Independence, Missouri. If you have corrections and/or additions to the information provided above, please leave a comment or contact me directly. Buchanan  Madeira T Todd ? D Duke [2 or 3] P Pendleton W W ?
? 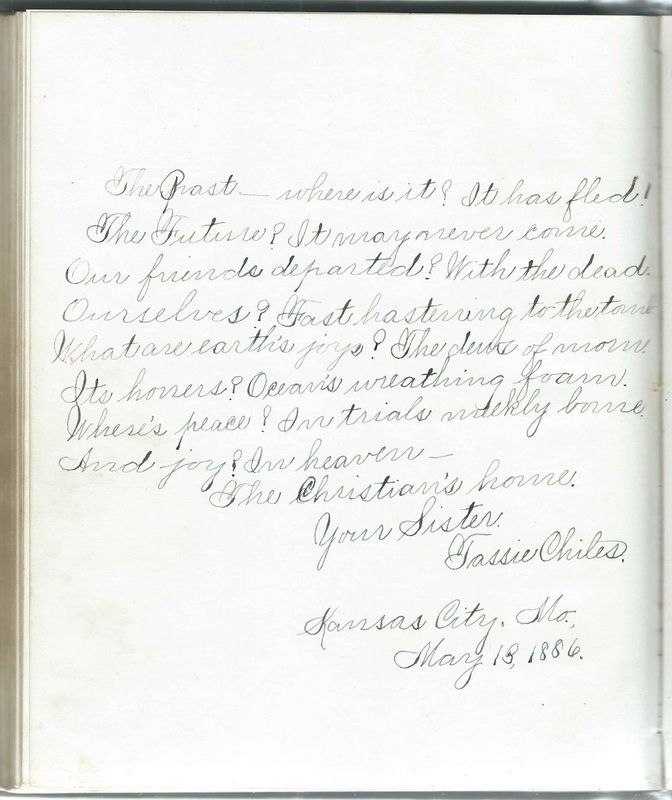 ; possibly another page signed by "The Giver"
Scottie M. Buchanan, inscribed on May 19, 1876; sounds as though Scottie and Artie will soon be parted. 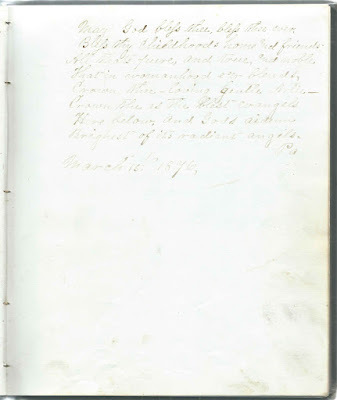 Presumably Mary Scott Buchanan, who married Allen Lee McCoy, who may have been inscriber A. L. McCoy of Independence, Missouri. 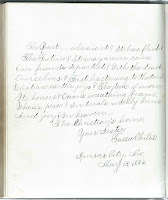 Kate Buchanan, inscribed on August 28, 1879. 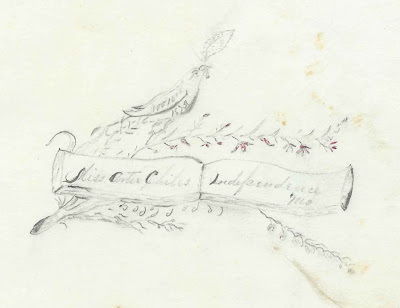 Perhaps Catherine Buchanan, sister of inscriber Mary Scott Buchanan, "Scottie"
W. G. Chiles of California; not sure of initials; possibly William Garnhart Chiles, son of Col. Joseph Ballinger Chiles, a brother to Artie's father, Samuel Irwin Chiles. William G. Chiles lived in Napa County, California. 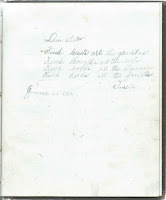 Presumably the same W. G. Chiles who inscribed another page in the album. C. M. Fox, inscribed at Independence, Missouri on November 24, 1875; possibly the Charles M. Fox who inscribed another page. C. D. McCoy; presumably Dr. Charles Danolds McCoy, brother of inscribers John Alexander McCoy of Chillicothe, Ohio and Lewis Foulke McCoy. A. L. McCoy of Independence, Missouri; presumably Allen Lee McCoy, who married inscriber Mary Scott Buchanan, "Scottie". Cousin of inscribers John Alexander McCoy, Dr. Charles Danolds McCoy and Lewis Foulke McCoy. Lewis F. McCoy, inscribed on April 25, 1877. Lewis Foulke McCoy, brother of inscribers John Alexander McCoy and Dr. Charles Danolds McCoy and cousin of inscriber Allen Lee McCoy. 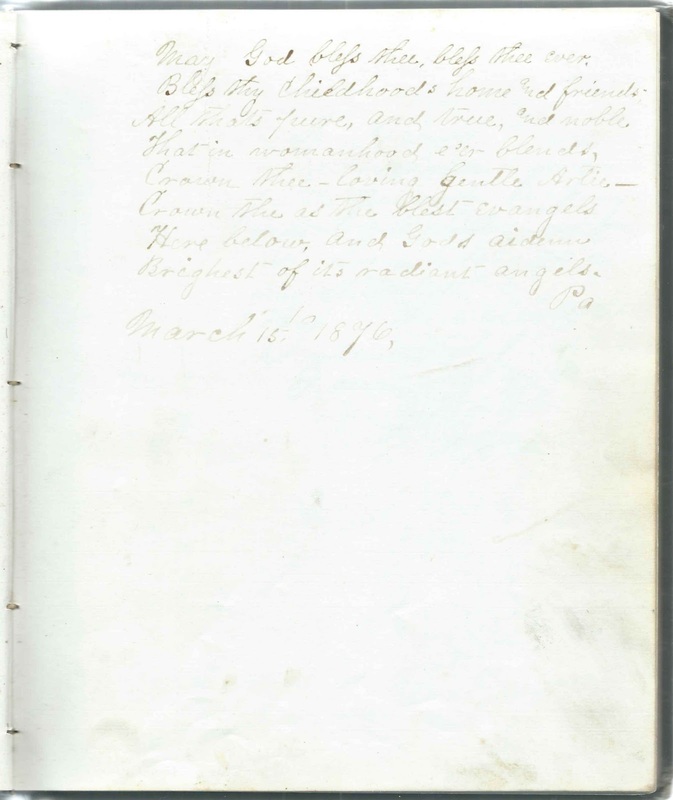 Flemon Pendleton, presumably Fleming Pendleton; shared the page, dated August 10, 1879, with a name that appears to be Samuel Woodson, Jr.; possibly Samuel Hughes Woodson, Jr.
John H. Reid, inscribed on February 25, 1877 at Kansas City, presumably Missouri. B. Roberts; middle initial possibly A or T or ? 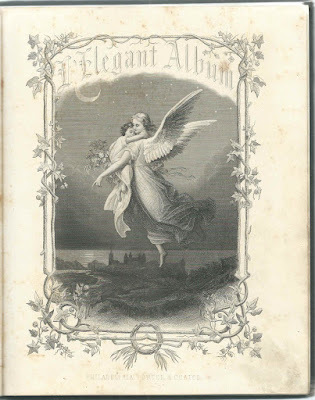 E. B. Vaughan; shared the page with Walker Buckner of Milwaukee, Wisconsin, who inscribed a page on October 4, 1880 - in a child's hand.